What is an “Entertainment Lawyer”? At the core, an “Entertainment Lawyer” provides legal advice, counsel and representation to companies and individuals in the entertainment industries, including television, motion pictures, radio, music, theater, publishing, digital media and video games. Although entertainment lawyers might represent “talent,” such as directors, actors or musicians, they more often advise companies that produce and distribute entertainment content, license celebrity brands, purchase and sell motion picture or music publishing catalogues, raise or invest debt and equity capital, and purchase and sell companies engaged in one or more of such activities. The areas of law most frequently associated with the field are intellectual property, contracts, corporate, employment/labor, securities, international, taxation, immigration, and litigation. Why the Entertainment Law track within the Entertainment, Arts and Sports Law LL.M.? Entertainment law is a demanding career that requires a firm grounding in the applicable substantive law, as well as practical skills training relating to how the entertainment industry works. By studying the entertainment track within the comprehensive EASL LL.M., it is possible for students enrolled in the track to fully prepare for the practice of “entertainment law” in today’s global environment, thereby giving them a competitive edge in the search for employment in the industry. In addition, Miami Law's program is ranked #3 in the U.S. by llm-guide.com. There is also a strong tradition of focus on entertainment law at the University of Miami. The Entertainment and Sports Law Society(ESLS) is one of the most active student organizations and it has hosted an annual international symposium on Entertainment, Arts and Sports Law since 1997. 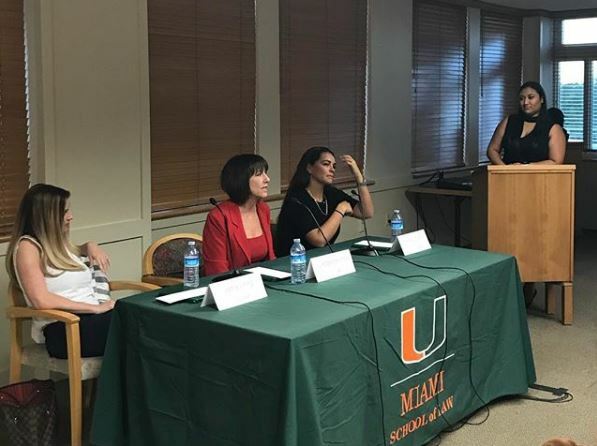 (Pictured: "Powerhouse Woman Panel" co-Sponsored by the Entertainment & Sports Law Society with Ivy Kagan Bierman: Partner, Loeb & Loeb; Jaime Rich Vining: Friedland Vining P.A. ;Brenda J. Schamy: DiSchino & Schamy, PLLC. highlighting the success and experiences of female attorneys in the creative spheres of IP & Entertainment.) Read more on entertainment law at Miami Law. Miami is a rapidly expanding economy, which includes the entertainment industry in a significant way in motion picture, television and music production and distribution. As a center of music and film and a hub for the Hispanic media industry, the city is fueled by an influx of international ideas and has witnessed the growth of both homegrown companies and international offices. These companies include Fortune 500 Latin American headquarters for: HBO, CAA, BBC, Nickelodeon, Discovery Networks, Sony, Disney, ESPN, Viacom. Students have access to this network with local mentors, practicums and externships. The LL.M. comprises two semesters of intensive study and training, consisting of required and elective courses, and a practicum. The program is dedicated to preparing students to practice in the entertainment industry, by focusing not only on the substantive law (e.g., business associations, copyright and trademark law), but also practical skills training (e.g., drafting and negotiating agreements, and client presentations). All courses are taught by Law School permanent faculty, and, where applicable, prominent practicing attorneys. The blended nature of the LL.M. enables students to maximize their studies and create a curriculum particular to their goals. Prerequisites, required and elective courses provide a well-rounded but field-specific curriculum to match individual professional interests. Entertainment Law: Motion Pictures and Television - Provides a comprehensive survey of the often intertwined legal and business issues encountered by transactional attorneys within the entertainment industry, with particular emphasis on theatrical motion picture and television. Negotiating and Drafting for the Business of Entertainment - Introduces students to advising clients, and reading, drafting and negotiating contracts with application to mergers and acquisitions, venture capital and private equity transactions. Copyright Law - Addresses the legal protection provided under the Copyright Act of 1976 (and subsequent amendments) for artistic, musical and literary works (including computer programs). Trademark Law - Introduces the legal protection under U.S. law for trademarks, service marks and trade dress; also covers related state and common law doctrines and relevant international agreements. Practicum - A practicum requirement affords students the opportunity for additional training in the workplace. Practicum placements have included: NBC Univiversal/Telemundo, HBO Latin America, BBC Worldwide Americas, Warner Music, Universal Music, Universal Creative, Spotify, Ultra, Jazwares, the Arsht Center for the Performing Arts, Chase Lawyers, and Attorneys David Ehrlich, Janine Small, Henry Root and Lita Rosario. Students in the program also attend the Symposium on Entertainment, Arts and Sports Law. Offered in conjunction with the Madrid-based Instituto Superior de Derecho y Economía (ISDE), a leader in legal education, Miami Law offers a course for law students and professionals who are interested in broadening their understanding of the global sports and entertainment industries and provides an understanding of the differences and similarities between the U.S. and the international entertainment and sports law landscapes. Director Harold A. Flegelman, Lecturer in Law, was a partner in the Corporate Department and Co-Chair of Loeb & Loeb LLP Los Angeles Corporate Media and Entertainment Practice Group, regularly recognized by U.S. News & World Report as placing it among the "Best Law Firms." While in private practice, he was engaged principally in advising clients in all legal and business aspects of the entertainment and media industries, including mergers and acquisitions, strategic alliances, venture capital, debt and equity financings, restructurings, business planning, executive employment arrangements and general corporate representation.